For over 30 years, BE Furniture has been partnering with companies large and small across the USA, to achieve the offices, environments, and cultures of their dreams…. Your Company Culture isn’t out of the box, and neither should your Office Furniture BE. Do your colleagues long for a cohesive office space that motivates and inspires them? Your office furniture sets the tone of your work environment, and let’s face it — office furniture is a workhorse. Settling for big box office furniture just doesn’t make sense when you can have high quality furniture with options and design coordinated for your company for an affordable price. the right partner for your office buildout. At BE Furniture, we can customize our furniture for your tastes and environment. Your custom office furniture will flow with your work environment and enhance the quality of your employees’ lives as well as create the image for visitors and customers that you want to convey. Most people say that your home is your sanctuary, but most people don’t have offices with custom furniture that can actually transform a company’s culture. That’s how powerful our custom office furniture spaces can BE. BE Furniture is an authorized manufacturer of over 50 of the biggest names in high quality office furniture. These include brands like AllSteel, Humanscale, Paoli, Gunlocke, and many many more. 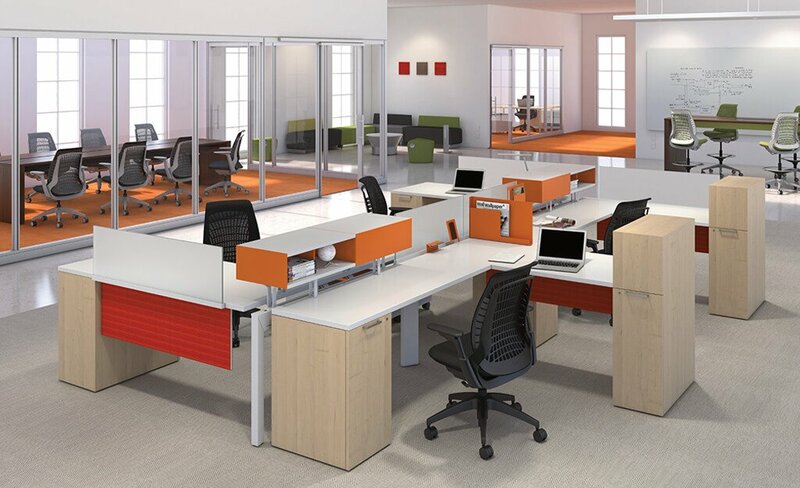 See our office furniture manufacturers page for the complete list. Whether you are a startup that’s starting from scratch, or a brand that has gone big and knows the lay of the land, there’s always room to grow in the culture of your business. If your old office furniture is looking worn and tired, it’s time to start thinking of how you can best take care of your colleagues and channel positive energy into your workspace. Our office fitout a team leverage the deep expertise of our space planning team, furniture designers, sales consultants, and project managers who can provide you with complete modern office fitouts from conception to completion with fast turnaround time and under the budget you thought you’d spend. Whether you are revamping your current space or looking to completely renovate, BE Furniture can help you transform your office space into a more functional, productive and visually appealing environment. For advice on your office design and fit-out project, please call us today at 973.335.7700 for a free, no-obligation consultation and discover the possibilities that are within your reach.